Manny Pacquiao's promoter is "optimistic" a rematch between the eight-time world champion and Jeff Horn will be confirmed in the coming days. 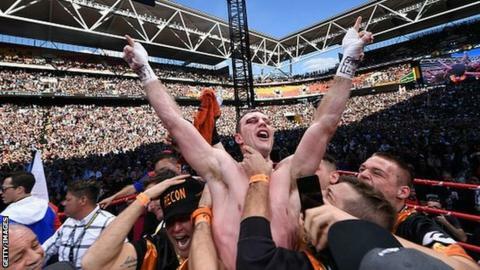 Former schoolteacher Horn stunned the Filipino by winning the WBO world welterweight title following a unanimous points decision in July. Criticism of the result led to a scoring review by the WBO which endorsed the Australian's win. "Manny's on board, Horn's on board," said Pacquiao's promoter Bob Arum. "The parties in Australia are meeting the Queensland government authorities on Saturday and hopefully the meeting goes well," said Arum, who added that the rematch could be in November. More than 51,000 spectators watched Horn's surprise victory over Pacquiao at Brisbane's Lang Park stadium on 2 July. British former undisputed world heavyweight champion Lennox Lewis and former LA Lakers shooting guard Kobe Bryant were among those critical of the judges' call on the result. They felt that 38-year-old Pacquiao had won the bout. The WBO stressed its subsequent rescoring was carried out for "transparency" as it did not have the power to reverse the original decision. Speaking about the original decision, which allowed Pacquiao to trigger a rematch clause, 85-year-old Arum said: "I wasn't outraged. I thought it was very close."